According to an AP-GfK poll conducted last month, only one-third of Americans say most people can be trusted. That’s down from half who felt that way in 1972, when the General Social Survey first asked the question. Almost two-thirds of the poll respondents said “you can’t be too careful” in dealing with people. Is that what you’re thinking when you’re sitting across from a supplier, customer, or other trading partner? Are they thinking the same thing about you too? When you consider that so much of supply chain management involves people and relationships, this decline in trust is very troubling. And it suggests that establishing truly collaborative and Vested relationships is actually becoming more challenging, not less. I interviewed two of the authors, Kate Vitasek and Jeanette Nyden, in a recent episode of Talking Logistics and I asked them why trust (along with transparency and compatibility) is so important to creating highly collaborative relationships. Watch this short clip for their response and great insights on this topic. If you choose to trust and remove that first big hurdle, you can move forward toward creating collaborative relationships that yield significant benefits for everyone involved. 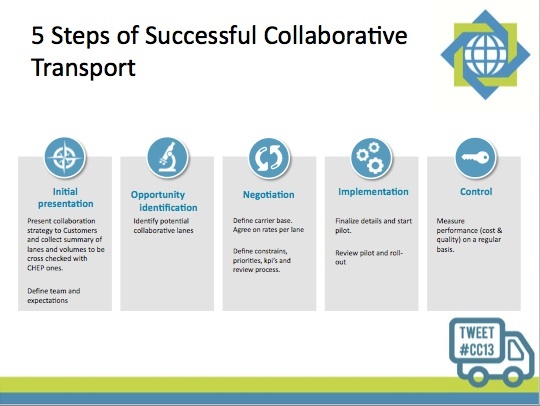 For example, at LeanLogistics’ ClientConnect 2013 Conference last month, I shared the stage with Frederic Fimbel, Head of Logistics Customer Collaboration and Sustainability at CHEP Europe, who provided an overview of CHEP’s collaborative transportation initiative with customers in Europe. In a nutshell, the company identified opportunities, with the help of Lean’s technology and network data, to create “continuous move” lanes with customers and other trading partners. 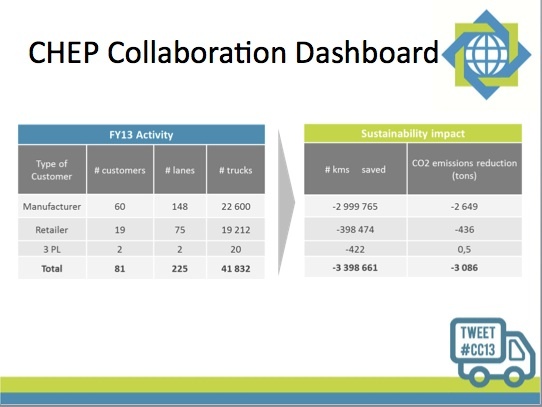 The net result was a reduction in empty miles, which yielded both cost savings and sustainability benefits for everyone involved. The slides below summarize the process and benefits. But here’s the statistic that really caught my attention: CHEP’s Net Promoter Score (NPS) — a management tool that measures the loyalty of customer relationships — was over 13 percent higher among customers that participate in the collaboration program compared to the average. In other words, collaboration strengthens customer relationships and loyalty. But it all begins with trust, which is something (if you believe the poll results) we’re less inclined to do these days. If “you can’t be too careful” in dealing with a customer or supplier, then your caution and lack of trust is holding your relationship back, preventing you from achieving greater things together. So, as we approach 2014, here’s a New Year’s resolution to put on your list: Choose trust and see where it takes you. (For related commentary, see Collaboration in the Network: The What, How, and Why, Breaking Down Barriers to Collaboration, and On Courage, Trust, and Patience in Logistics). Note: LeanLogistics is a Logistics Viewpoints sponsor.